Please be careful when selecting the color for your Chevrolet Suburban Sun Visors. We have many color options to choose from, and some shades are very similar. If you are not 100% certain of the correct color, please allow us to send you samples by	clicking here. Stock Interiors is proud to offer the highest quality	Chevy Suburban Sun Visors available. 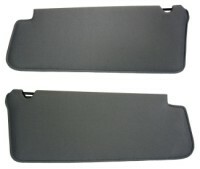 Our replacement Sun Visors are made to look and fit just like your original Chevy Suburban Sun Visors. Our manufacturer has been making Sun Visors since 1949 and the patterns were created when the cars were first introduced. So you can be sure that your Chevy Suburban Sun Visors will always fit and look just like new!